“For example, the presidential residence in the city of Yekaterinburg, which cost 1.2 billion rubles [about $40 million] to construct, and which President Medvedev has stayed in once,” said the journalist. A similar example was Konstantinovsky Palace in St. Petersburg, a crumbling historic landmark that Putin ordered be renovated in 2001 for use as a presidential residence. The official cost of renovation: $250 million. There were more. One new presidential residence was constructed just two years ago. Another called Lunnaya Polyana is now in the works, blocked off from public view. An Olympic residence in Sochi is also planned for construction. 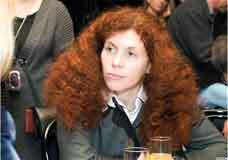 All in all, said Latynina, Russia has built thirteen official residences for its president. Compare this, she proposed, to the number of official presidential residences in America: there are but two. And neither the White House nor Camp David is anything to rival the grandeur of Konstantinovsky Palace. “My point is that if you consider the number of residences, then Russia is a superpower and the United States just gets these two little things,” the journalist said. Frivolous spending on the part of the Russian elite brought about the question of why the Russian government tells its citizens that “the West doesn’t love us.” If that were true, asks Latynina, then why would Deputy Prime Minister Igor Sechin, Putin’s right-hand man, keep his plane in Helsinki and buy three different villas in Sardinia? Why are oligarch Roman Abromovich’s yachts registered in the West, including the $50 million one he gifted to Vladimir Putin? Why do all of the people who tell Russia’s citizens that the West doesn’t love them send their children to study in England? “Why don’t they keep their money in the banks of Iraq, North Korea, Venezuela, or the other wonderful countries that are friendly to Russia and love us a great deal?” asked Latynina. In some cases, they do. On October 17, 2009, Prime Minister Putin announced the government’s decision to make a $500 million purchase of microprocessors with 90 nanometer process technology from the primarily government-supported French-Italian firm STMicroelectronics. Two weeks before this happened, Intel had announced that they were going to begin producing microprocessors with 32 nanometer technology. What was the point of buying something so expensive that was already out of date? According to Latynina, it was simply a way of transferring money abroad. 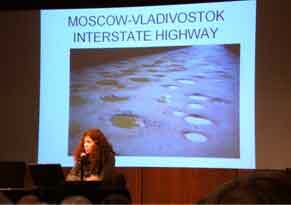 Thus, in a nutshell, was Latynina’s dour prognosis of Russia’s current state of affairs. That said, Latynina was skeptical of the effectiveness of initiatives by the Russian opposition, including a petition calling for Putin to resign that has so far gathered more than 18,000 signatures.